Showing longer life working, these Deep Offset Striking Wrenches are available in the market in different sizes and shapes. In addition to this, these presented striking wrenches are optimal in finishing and quality checked by the experts several times before handing to the customers. These wrenches are made of ductile metal. 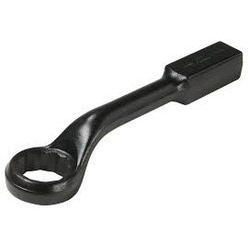 Established in the Year2001, K. G. N. Sales is a prominent organization engaged in Manufacturing, Supplying and Trading a range of Deep Offset Bihexagon Ring Spanner, Single Ended Open Jaw Spanners, Jumbo combination Spanners, Tubular Box Spanners, Sledge Type Single Ended Bihexagon Ring Spanner, Square Drive Sockets Attachments and Square Drive Spanners. We are instrumental in providing quality assurance products to our customers. These products are easy to use and developed with various advanced features. We provide these products on large scale at competitive ranges. Moreover, for the satisfaction of our reliable clients, we provide these machine parts in various sizes and specifications.